Streaming – What's Your Tag? Some of you may already know that we dabble in the world of video game streaming, and for those of you who don’t, well… we do. 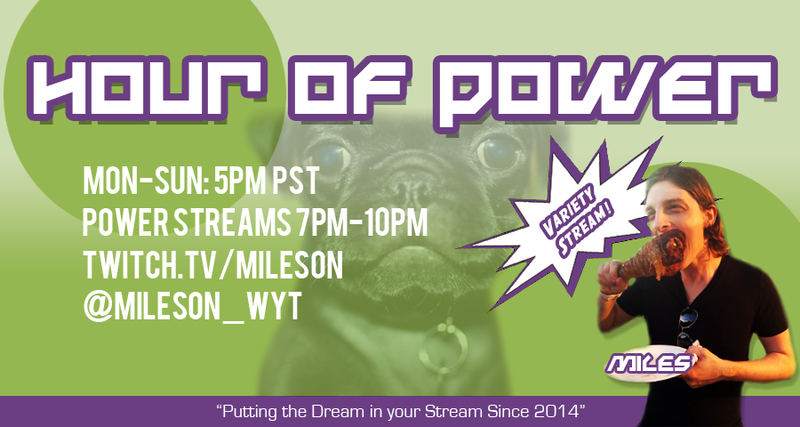 Rather, Miles does and he’s ridiculously happy to introduce the Hour of Power every damn day at 5pm PDT on Twitch! We have an awesome community and we also love seeing new faces in the chat, so pay us a visit and expand your social circle. Maybe you’ll be lucky and bare witness to one our of gross food challenges, or join in on our community events! Be sure to subscribe to my Twitch channel and follow us on Twitter for updates on the games I’ll be streaming. You can also catch the highlights over on our YouTube channel! Excited for Gears I just hope they don’t let us fans down! Thanks for checking out the site and reaching out to us! Makes us feel all tingly inside. The new gears sounds amazing! I don’t know if you’ve looked at any of our earlier stuff, but we downright love Gears of War. tingly is good lol yeah i watched the trailer they released looks awesome i think they might do an Army of Two kinda style but im not sure! Yeah i checked some of the stuff out and some reviews good stuff! Thanks again for checking our stuff out! We are always adding new articles and ridiculous things to the site, so keep checking back! And maybe I will see you on Gears of War sometime! Do you accept articles? I would be honored to write a once off for your blog, so long as I’m credited and linked. We do accept articles. Feel free to send us an email and we can give you more specifics. I’ll send one tomorrow when I have more time. Sent you a query outlining a possible article. Lemme know what you think! Thanks for the kind words. It’s very much appreciated. Thank you for my like on Mount and Blade review, I was struggling to find guys like you on word press. Your sight is just my cup of English Tea. No problem at all. Thanks for swinging by! We like to put a little cream and sugar in our yea. That’s why we’re so sweet. That is not Punny at all. Punny. God I am intelligent. I’m glad that was a joke, I might have had to give you a couple lumps…. Badoot tsss. Oh this humor is the worst. Pingback: Mileson Plays DreadOut | What's Your Tag?